Did you know that a tadpole becomes a frog? The common pond frog’s life begins in a quiet pond as one of many jelly-like eggs laid together in a mass by the mother frog. In a few days, the egg hatched into a tiny, legless tadpole that breathes with gills, as fish do. it has a long tail which it uses for swimming, and eat plants that grow in the water. 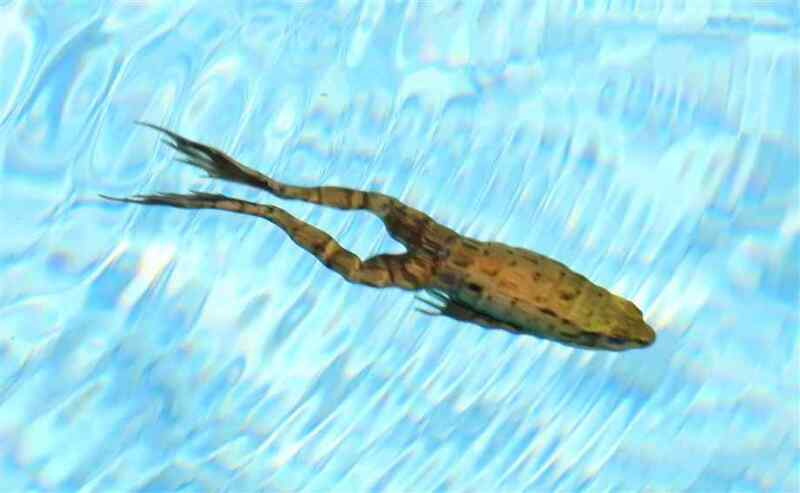 As the tadpole grows, first two hind legs and then two front legs appears. After a time the tail begins to shrink and the tadpole loses its gills and gets lungs instead. Then the tadpole comes to the surfaces of the water to breath air. At last its tail disappears and the change is complete. As a young frog, the creature is now ready to leave the water and begin a life as a hoping land animal. If you visited a pond or lake this summer, you may have seen a ducklike bird that quickly vanished underwater if you approached too closely, only to come up far away. What you probably saw was a kind of waterbird know as a grebe (pronounce as greeb). Grebes grow to be less than two feet long and have softly patterned plumage of white, gray, black or brown tones. They feed on fish, crawfish, and water bugs. Though expert swimmers, grebes are clumsy on land. Their feet are placed so far back on their bodies that they can hardly walk. Baby grebes are born on a raftlike nest woven of reeds and pond weeds. They can swim and dive as soon as they are hatched. How does a frog catch its food? All summer long, the little frog squats, motionless, on the bank of a quiet pond or brook and watches for passing insects. If a fly or cricket passes within reach, the frog’s long tongue will snap out like a flickering ship, so fast that you can scarcely follow the action. The insect is caught on the sticky tip. Just as quick as the frog flips its tongue back into its mouth. The frog’s tongue is fastened at the front of its mouth, not the back, so that it can be flipped out a long way. The frog’s mouth is equipped with feeble, practically useless teeth, which are present only in the upper jaw. So it must live mostly on small creatures that it can swallow in one gulp. 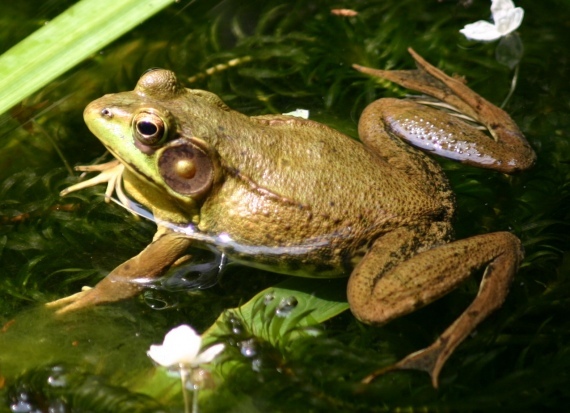 Frogs also eat earthworms, spiders and winnows that they catch in the water. Toads capture their food in much the same way as frogs do. The frogs catches insects and other small food animals on the sticky tip of its long tongue. All summer long, the little frog squats, motionless, on the bank of a quiet pond or brook and watches for passing insects. If a fly or cricket passes within reach, the frog’s long tongue will snap out like a flickering whip, so fast that you can scarcely follow the action. The insect is caught on the sticky tip. 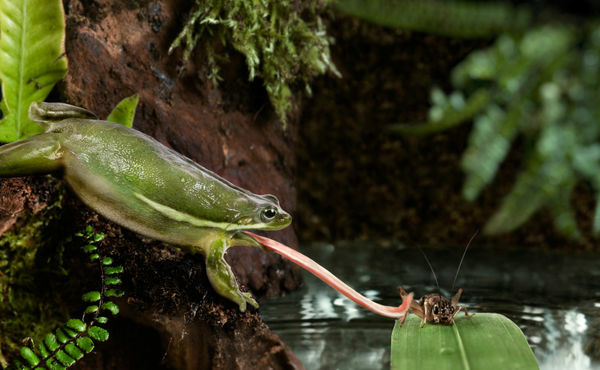 Just as quickly the frog flips its tongue back into its mouth. 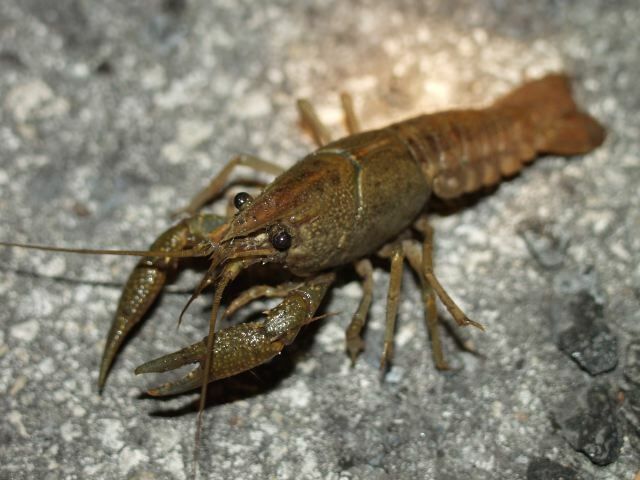 Crayfish are small fresh-water shell fish that look like miniature lobsters. If you have ever played by the bank of stream or pond, you may have seen a small animal that looked like a miniature lobster living at the bottom of the water near the shore. What you saw was a fresh water shell like known as a crayfish. It is easy to see that the crayfish, sometimes called crawfish or crawdad, and the saltwater lobster are close relatives. Both have 10 legs. The front legs end in large pincers. These pincers are used to catch any prey that comes near, as well as for defense. The four other pairs of legs are used for walking. The crayfish escapes from danger by swimming backward through the water with quick flips of its fan-like tail. Like the lobster, the crayfish hatches from an egg. A hard shell covers its soft body like a suit of armor.